Our Mat-Su Valley Bed and Breakfast Association members are centrally-located between Anchorage and Denali National Park, and Mat-Su Valley bed & breakfasts give you access to all the best of Alaska in our region: abundant wildlife, the largest glaciers accessible from the road system, and a great variety of activities that get you out into Alaska's natural beauty. 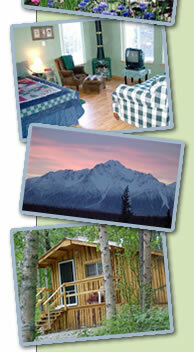 We invite you to choose our Mat-su B&Bs for your lodging on your stay in Alaska. Enjoy our warm hospitality and quality B&B's as you tour our region, the spectacular and scenic Matanuska-Susitna valleys. Our inspected and approved Mat-su bed and breakfasts are in Palmer, Wasilla, Big Lake, Willow, Talkeetna, and Trapper Creek, or along the Glenn Highway Scenic Byway on the way to Glenallen or Wrangell-St. Elias Park. Take in the majestic mountain ranges and glaciers which ring the valleys. In Denali National Park, Mt. McKinley stands as the highest peak in North America. Wildlife such as moose, bear, wolves, mountain sheep and goats, and birds are plentiful. Salmon fishing in the Mat-Su is some of the best in Alaska. Hatcher Pass is a wild and natural mountain pass which includes Independence Mine, a gold mine from way-back that visitors can tour, and great hiking opportunities. The Matanuska Glacier is the largest glacier on the road system, and visitors can hike up onto the blue ice for miles. The Knik Glacier area is a great way for visitors to "see it all" as it rises quickly from tidwater ecosystems of swans and shore birds to river habitats of moose and beavers, to lowland mountain animals such as bear and caribou, to the sheep and goats which scramble along the tops. For a sure way to see animals up close, two farms near Palmer offer the chance to meet musk ox and reindeer. Active adventures include ATV or Jeep tours, dog-sledding presentations and rides, flightseeing, glacier trekking, whitewater rafting, hiking, biking, canoeing, and kayaking. Or just go for a drive in any direction and see the breath-taking scenery. Come enjoy the Mat-Su Valley and stay with us!